The next bunch of weirdoes. These probably are the most recognizably Brotherhoodian models from their range so I just called them assassins. 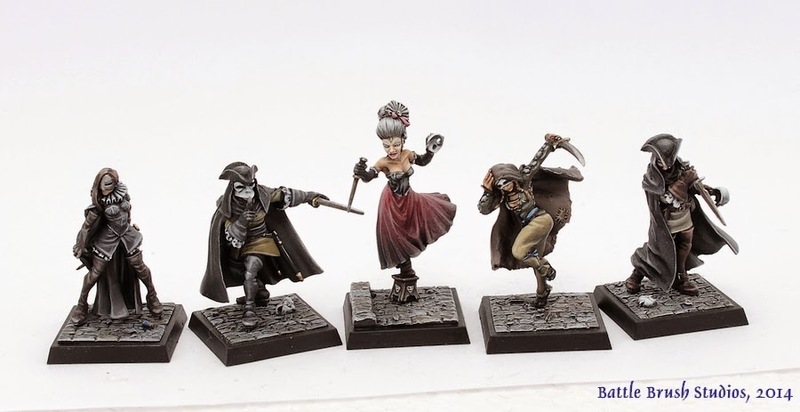 From left to right: Bonaccia, a stunningly cool model set apart from her pals by being the only one to wear an iron mask and a smart looking collar. Next to her is Apagado with his sneaky pose and "Shhh" gesture. Such a great model. I love this guy. In the middle we got Bella Cigna, another really cool model (I'm starting to sound like a broken record when it comes to this miniatures range, I know), inexplicably standing on a little stool. Just look at that face. :-) I painted this model before for another client but it's been way too long since then. She's just so much fun to paint. Between the flowing skirt, the hair and the little stool the face of course is the most striking part of the model. Then we got another Conscritti with a really dynamic, cute pose and braids and Trucco, whose stance is just full of movement. 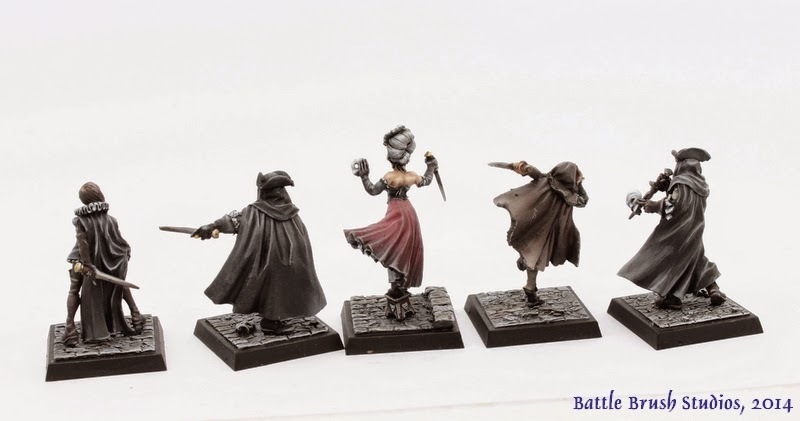 What can I say, I'm utterly impressed with this miniatures range. ...and of course I, as always, hope that you like them as well!